Nancy Reagan was the last first lady to privately fundraise and spend time restoring and decorating Blair House which is across the street from the White House with the mission being the United States guest home for visiting Heads of State House. If anyone knows it is past time for several upgrades in those adjoining townhomes, it is the latest first lady. C'mon, a bed that needs an added section for the head of state if they are over six feet tall is just not appropriate. Michelle Obama ordered a beautiful antique bed for the White House and had it modified to Queen-sized for a comfortable night's rest. No idea who the lucky Obama is that sleeps in on that one. From the Reagan era, the square creamy chair with peach pillow appears much like the chair upholstered in white above. The famed Chinese screen is on the right. From Architectural Digest from 1984. We do know that Michael Smith of California received official status as Michelle Obama's interior designer in January. Laura Bush had Kenneth Blasingame of Texas and Hillary Clinton used Kaki Hockersmith of Arkansas. Nancy Reagan also had a California designer that indulged her taste for florals and wall paper with florals. Once every decade, Architectural Digest usually does a photo spread including parts of the private residence once significant work is accomplished by a first lady, the curator, the staff and the White House Historical Association after collaborated on significant refurbishing of state rooms. 1984 Refurbishing of Nancy Reagan's dressing room off the master bedroom. This is the room Laura Bush showed Michelle Obama where to look out of the window to see the Oval office. Malia's & Sasha's swing set is just beyond the Oval Office. This is from the 1962 refurbishing jackie kennedy did to the same dressing room off her master bedroom. Seems reasonable that this will be Michelle's Obama's personal/office space in her version of the room. Photo courtesy Architectural digest. Though there is a timeless feel to the furniture, it goes through iterations and upholstery makeovers like the couches Laura Bush had in the West Sitting Hall lived previously as President Clinton's Oval Office couches. We have seen very little of what Michelle decorated in the residence publicly, but there are some clues. 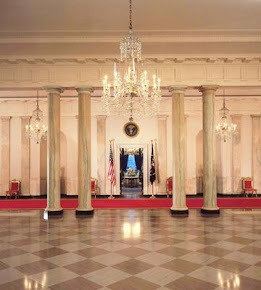 Pat Nixon started the trend of painting the Center Hall in yellow. Each first lady since has kept it that way with varying shades to make it feel sunny. Though the lighting is bright in 2009 photo, it appears Michelle chose a shade of paint that is a softer creamy buttercup color. She nixed the idea of porcelain plates in the Federal styled built-in shelving units other first ladies used. The piano is across from what prior was the placement of an eighteenth century Chinese screen (above in 1984 AD photo) that dominates that southern wall because there are only the paladium windows at each end of the Center Hall. Laura Bush in more formal East Sitting Hall with same patterned rug/carpet seen above in Center Hall in 2009 photo. 2005 Photo courtesy Architectural Digest. 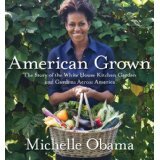 Last November, Michelle received a book that catalogs (pictures, dimensions, used by, etc.) the White House's furniture collection for her to choose from to have ready on the first day in the White House. The Art Collection and the offerings from various museums to decorate the residence portion of the White House are also made available. Mrs. Bush placed the donation from the Kennedy family's prominently in the West Sitting Hall where she could see the Monet as soon as she sat down or left the master bedroom. I am looking forward to hearing about some of the art choices the Obamas are making for the residence with such a world class selction to choose among.